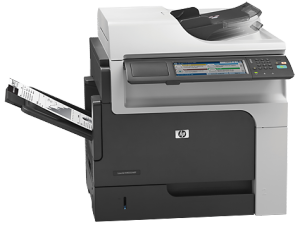 Special – New HP LaserJet M4555h mfp only $2100.00! This price will not last long! Increase productivity—this MFP M4555h features fast print and copy speeds, an HP Easy Select control panel and outstanding paper-handling features. Use market-leading management tools to integrate the MFP into existing printing environments. HP High-volume Laser Multifunction Printers are designed to deliver fast, reliable color or black-and-white printing/copying – plus a range of other productivity-enhancing tools – across busy departments. Preview jobs using the pivoting color control panel and use image preview to make adjustments to scan jobs. Proactively manage printing environments and get easy setup and configuration with HP management tools. Extend the capabilities of workgroup print environments with a rich portfolio of easy-to-integrate solutions. Advanced security for sensitive information. Process jobs securely through user authentication, IPsec and IPv6. Outstanding energy- and paper-saving features. Conserve resources and save paper—use automatic two-sided printing and PIN printing. Get free, easy cartridge recycling,9 plus reduce shipping materials with HP ClearView packaging. ← Try a Genuine Xerox toner or a Xerox Replacement Cartridge and receive a $15 Gift Card.